As usual, a lot of the talk at ESCRS in Copenhagen in mid-September was about recent advances in diagnosis and treatment for eye conditions. But which research topics were at the forefront? One way to answer this question is to look at the “e-posters”—online presentations of research results that researchers and ophthalmologists had submitted. About 1,000 of these were turned in, and they could be viewed on dozens of computers in the e-poster area of the exhibition hall. We decided that an analysis of the topics of these e-posters would provide some insight into the most active areas of research. The ESCRS divided the e-poster topics into 36 categories. 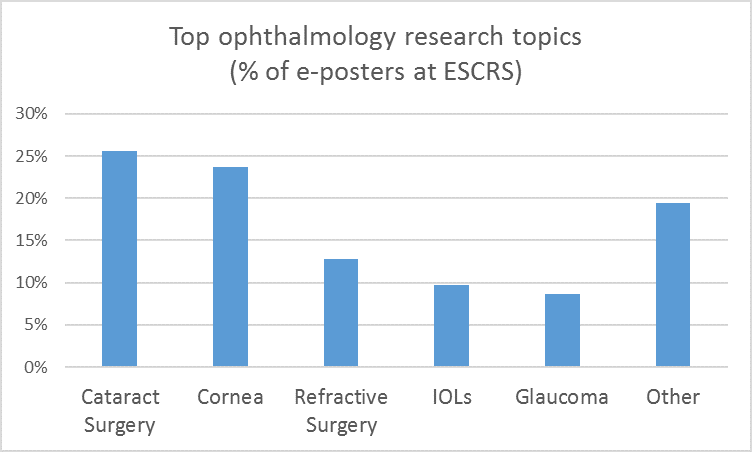 We counted the number of e-posters in each category, then grouped the categories into six broad research areas: Cataract Surgery, Cornea, Glaucoma, IOLs, Refractive Surgery, and Other. The chart below shows the proportion of e-posters falling into each of those categories. Not surprisingly, cataract-related topics were the most common: 26% of posters fell into the Cataract Surgery category, and 10% were about IOLs. But cornea-related topics (24%) were also popular, especially those related to corneal surgery and corneal cross-linking. The largest single category was Cataract Surgery Outcomes, with 116 e-posters. These dealt with the results of various approaches to IOL implants, with long-term changes in the eye after surgery, with the success of various techniques and products, and so on. From the poster topics t is clear that, on the one hand, cataract surgery is a very common and successful procedure; but on the other hand, there are still many opportunities to optimize it. The e-posters from this year’s conference continue to be available to ESCRS members by logging into the ESCRS website.